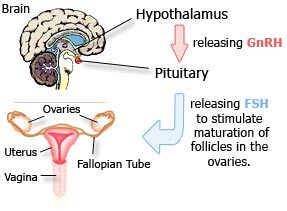 Follicle-stimulating hormone (FSH) is a hormone found in humans and other animals. It is synthesized and secreted by gonadotrophs of the anterior pituitary gland. FSH regulates the development, growth, pubertal maturation, and reproductive processes of the body. FSH and luteinizing hormone (LH) act synergistically in reproduction. Specifically, an increase in FSH secretion by the anterior pituitary causes ovulation. FSH is a glycoprotein. Each monomeric unit is a protein molecule with a sugar attached to it; two of these make the full, functional protein. Its structure is similar to those of LH, TSH, and hCG. The protein dimer contains 2 polypeptide units, labeled alpha and beta subunits. The alpha subunits of LH, FSH, TSH, and hCG are identical, and contain 92 amino acids. The beta subunits vary. FSH has a beta subunit of 118 amino acids (FSH β), which confers its specific biologic action and is responsible for interaction with the FSH-receptor. The sugar part of the hormone is composed of fucose, galactose, mannose, galactosamine, glucosamine, and sialic acid, the latter being critical for its biologic half-life. The half-life of FSH is 3–4 hours. Note: The carbohydrate moiety is linked to the asparagine at positions 52 and 78. Note: The carbohydrate moiety is linked to the asparagine at positions 7 and 24. The gene for the alpha subunit is located on chromosome 6p21.1-23. It is expressed in different cell types. The gene for the FSH beta subunit is located on chromosome 11p13, and is expressed in gonadotropes of the pituitary cells, controlled by GnRH, inhibited by inhibin, and enhanced by activin. FSH regulates the development, growth, pubertal maturation, and reproductive processes of the human body. In males, FSH induces Sertoli cells to secrete inhibin and stimulates the formation of sertoli-sertoli tight junctions (zonula occludens). In females, FSH initiates follicular growth, specifically affecting granulosa cells. With the concomitant rise in inhibin B, FSH levels then decline in the late follicular phase. This seems to be critical in selecting only the most advanced follicle to proceed to ovulation. At the end of the luteal phase, there is a slight rise in FSH that seems to be of importance to start the next ovulatory cycle. Like its partner LH, FSH release at the pituitary gland is controlled by pulses of gonadotropin-releasing hormone (GnRH). Those pulses, in turn, are subject to the oestrogen feed-back from the gonads. FSH stimulates the growth and recruitment of immature ovarian follicles in the ovary. In early (small) antral follicles, FSH is the major survival factor that rescues the small antral follicles (2–5 mm in diameter for humans) from apoptosis (programmed death of the somatic cells of the follicle and oocyte). 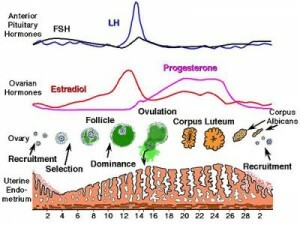 In the luteal-follicle phase transition period the serum levels of progesterone and estrogen (primarily estradiol) decrease and no longer suppress the release of FSH, consequently FSH peaks at about day three (day one is the first day of menstrual flow). The cohort of small antral follicles is normally sufficiently in number to produce enough Inhibin B to lower FSH serum levels. In addition, there is evidence that gonadotrophin surge-attenuating factor produced by small follicles during the first half of the follicle phase also exerts a negative feedback on pulsatile luteinizing hormone (LH) secretion amplitude, thus allowing a more favorable environment for follicle growth and preventing premature luteinization. This entry was posted in Uncategorized and tagged amino acid, anterior pituitary gland, follicle stimulating hormone, follicular growth, germ cell, glycoprotein, gonadotrophs, gonadotropin releasing hormone, granulosa cell, luteinizing hormone, ovulation, pubertal maturation, sertoli cell, zonnula occludens on June 22, 2012 by alwin.